A kitchen is incomplete without an oven but not everybody has a space or budget to buy a full-fledged oven. So what can you do when you need to bake a cake or make toast? Well, a lot of people opt for a Microwave Toaster Oven combo or best air fryer. These are great for making toast but are essentially ovens so you can bake, broil and keep food warm. Do you know what kind of toaster ovens you need? A red toaster, a microwave toaster oven? Or perhaps, you’re going tight on budget and are looking for best microwave toaster ovens under 50. Most of these toaster ovens sit on the counter but there are those too that can be fixed under the cabinet and are therefore called under the cabinet microwave ovens. The later save you counter space and are just as good as over the counter ones. Next question you should be asking is “Which toaster oven brand should I go for?” There are so many brands that produce toaster oven and toaster combo with each model having something unique to offer. The sizes and weights vary from one model to another but most standard ovens can accommodate up to 4 slices. These are multifunctional ovens that can be used in lieu of a big oven or used in addition to it if you have one. You cannot cook big sized foods like a turkey but you can bake most things like a pound cake or a pie. Even if you just need an electric toaster, it makes sense to get a toaster oven microwave. It does not take a lot of space and provides a lot of other functions that at some time prove very useful. Rather than having a big oven for baking for very rare occasions, it makes sense to have a small toaster oven. We at Home Kitchenary are dedicated to cutting through the jargon and breaking down important details to help you make an informed decision. The market is brimming with a lot of products within this category and it can be confusing to find the most suited product for yourself. Black+Decker is a renowned name in the world of kitchen appliances and with this microwave toaster oven, your life will be a lot easier. It is a compact oven that is multipurpose as you not only can make toast but you can also bake, broil and warm food. The best thing about this particular product is that you can even bake a 9-inch pizza. The back of the oven is curved so as to fit the pizza. One of the most common issues we have seen people report with this toaster oven microwave is that the toasting on the slicing is uneven. For those who are toast fans like us, that is not the ideal breakfast. With the EvenToast technology, the interior is designed in a way to ensure even toasting. As a result, you get the perfect toast that is 30% better toasted than many other products from other brands. Everyone likes their toast in a different manner, as some like them lightly toasted while others like fully and dark ones. This electric toaster gives you the choice of toasting up to four slices just as you like. Using the 30-minute timers and stay on option, you can customize your toast to your liking. Since this is a small oven, it is great for those who are short on space. What makes it great is that it gives you the advantages of two appliances in one: an oven and a toaster. Should you occasionally feel like baking a cinnamon roll or a pie, you can do so using this very toaster oven. Is it easily cleanable? Yes, It is an easy to clean appliance made from premier quality stainless steel. There is a removable crumb tray so you will not even have to clean it too often. Just empty the tray and put it back in. Normally we use our ovens for these purposes most of the times. With just one press, you can achieve whatever you like. We know how annoying it can be to turn knobs for temperature and time when you get back home after an exhausting day at work. It is a good choice for a small family because of its generous size allowing it to toast 6 slices and a 12-inch pizza. The timer gives you ample time range of 120 minutes to bake time-consuming dishes. And the maximum temperature you get is 450 degrees. It has the convection heating feature which we all know is a blessing in these appliances. Convection heating basically utilizes a fan to spread the heat evenly. This helps you get toast that is evenly toasted and cakes that are evenly baked. And the best part is that this feature is really quiet. It is great for all types of dishes thanks to the two position of the rack available. Whether you want to place something close to the broiler or want something a bit taller to be baked, you can adjust the tray position accordingly. Isn’t that great? 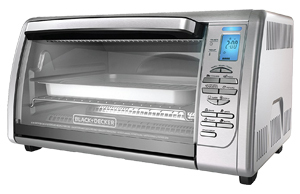 Like other Black + Decker products, this microwave toaster oven is incredibly easy to clean as well. You can just use a damp cloth to clean the non-sticky surface of the interior. The crumb tray makes things further convenient and quick. Like the one above, size can be a concern. If you are thinking that installing such a product is difficult, think again. This toaster oven under cabinet is super easy to install as there are detailed guidelines to fix it. It will live up to its name and make a lot of counter space in your kitchen. Even a small oven can take considerable space of the counter, especially in smaller kitchens. You have distinct buttons for turning it on and off and for the different modes. There are three modes including toast, bake and warm. This helps make it very user-friendly and quickly gets things done. Its toast settings are quite amazing as you have 7 different levels of it. As for temperature, the range is quite wide too with the highest temperature being 400 degrees. What is the timer limit? The timer has a 30-minute range which decent enough for baking needs. The temperature is easy to change as well with the touch buttons for increasing or decreasing. If you have happened to have other Space-Maker appliances you can connect the specially designed Save A Plug outlet. This way you do not have to utilize a different outlet. How many times have you had to install outlets for accommodating all appliances? Probably many times. We know that a lot of people like stylish appliances in their kitchen and this should make for a very appealing toaster oven and toaster combo. It will take your kitchen decor to the next level and add to the overall look of it. Its black color would universally go with all kinds or colors of cabinets. Anyone can easily install it if the guidelines are closely followed. There are two sets of screws with different lengths to provide you room to fix it to your own liking. It would not take too long to fix this toaster oven under the cabinet. 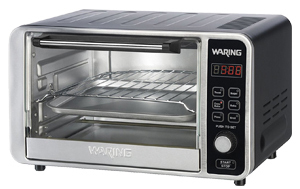 If you are looking for a generously sized countertop oven, the Pro Digital Convection Oven from Waring is what you need. It has 0.6 cubic foot space which can accommodate a 12-inch pizza and up to 6 pieces of toast. You might want to ask how much space does it take on the counter? Not much! The design of buttons and functions is very simple. The different modes can be turned with simple touch buttons. The small LCD display over the button shows the temperature and time. Anyone can easily use it without needing to refer the manual. 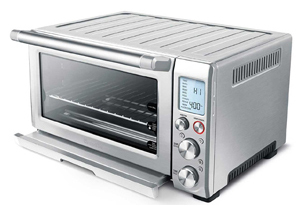 The different modes available include toast, bake, broil, bagel, pizza, and convection baking. The convection baking is its prime function and provides quick and even heating through fans. This works out great when you need to bake something quickly. You not only get even baked dishes, but you also get evenly toasted toast. One of the main reasons to select this oven is its energy efficient feature. A lot of us want energy efficient appliances to reduce utility costs. It is super easy to clean. The inner components like the rack, pan and crumb tray can easily be washed with warm water. If you keep emptying the crumb tray often, there will not be any accumulations and you will not have to wash it often too. The easy to clean capability is a blessing in its own. Imagine having to make toast for breakfast and for that having to clean the oven first. Add to this its convection heating and you have yourself a convenience packed best convection toaster oven. How about an electric toaster that can cook you a roast and make hash browns as well? The Flash Xpress Toaster can do all of that. 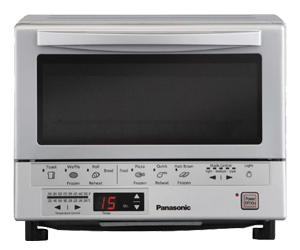 Panasonic is all about providing control in your hands and that is exactly what it is doing with Flash Xpress Toaster Oven. This product is a small oven with big powers as it cooks really fast and is even easier to operate. What makes it best for toast is its Flash Xpress technology that uses its double infrared heating to make toast 40% faster. This works out great in the morning when you are getting late and for this, we really appreciate Panasonic. Not only do you get toast fast you get them heated evenly. This is done through the close quartz that is positioned both front and back to evenly heat the dish. It has a very nicely designed menu with icons for different modes. You have toast, waffle, pizza, quick reheat, and hash browns buttons that are pre-programmed to heat and make these particular foods. You can also adjust the temperature yourself too with a wide range to suit your needs. However, the pre-programmed options make it very convenient to just hit a button and then the cook time is automatically fixed. The digital timer legibly shows you how long it remains until completion. The accessories are included too and are easy to clean. You have a crumb tray, a square inner tray, and a baking pan. Another great thing is that the baking rack is connected with the see through a door so when you pull it open it comes forward making it easy to insert or remove dishes. This oven has been designed to help you with all day meals from toast in breakfast to snacks in the evening. Everything can be done with one simple and manageable appliance that does not even take much space in the kitchen. The design of this oven is quite simple and the silver color universally looks great with most kitchen themes. Since it is from a well-known brand, you can be sure about the quality you are getting with this purchase. This smart oven from Breville is equipped with four quartz that produces ample heating to bake and cook things through. It has the Element IQ technology that basically helps with even cooking. The heat from the quartz is automatically adjusted to ensure this. Like many other microwave toasters on this list, this one has built-in pre-programmed functions for cooking particular kind of foods. There is a dial for that and eight such option that include bake, broil, roast, bagel, cookies, reheat, pizza, and toast. This covers most of the dishes you will be using the oven for which is a big convenience in its own. It is a modern appliance with the latest technology to ensure you get a great return for your investment. Size wise it is good for a family of two or three as you can toast up to 4 slices in one go and cook an 11-inch pizza. This makes its interior capacity 0.45 cubic feet. How exactly does it stand out? They have made this appliance one of a kind with stainless steel and quartz instead of metals for heating like that in many other toasters or ovens. The preprogrammed food options on the dial take the guesswork out of the cooking. However, that does not mean you cannot make changes. You can customize the settings according to your recipe. This oven is so smart that the customizations you make during the different food options remain in its memory. With this in your kitchen, the control is in your hand. The control buttons make it very easy for you to use it the way you want to. If you want to see the temperature in Celsius instead of Fahrenheit, there is a button for that as well. We know that a lot of us end up using the toaster oven microwave for toasting only because of our overly busy schedules. If that is the case with you then this is the best as it’s optimized for making toast. You have separate buttons to control the darkness of your toast. Are you all about power when it comes to electronics? 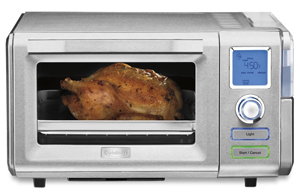 This particular product from Breville has a whopping 1800 watts power so you can realize that it is one powerful oven. 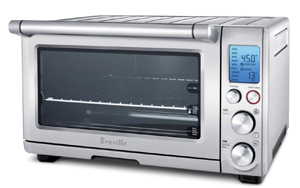 It is basically the smaller version of the Smart Oven from Breville that is very popular all around the world. If you could not have the smart oven because of a shortage of space, this should relieve you. It has a dial function for 8 pre-programmed food options that make your life super easy. Time and again we have seen people complain that even with ovens they have to set the time or temperature and keep a close look on the dish. However, with these built-in functions, their job boils down to just rotating the knob. The heating elements have individual control so they adjust power as needed. This is important whether you primarily use the toaster oven microwave for making toast or baking cakes. Cheaply made ovens just heat in one position and as a result, you get unevenly cooked dishes. The three rack positions give you enough room to fit in a tall cake or a roast easily. Besides from crumb tray, you also get some other important accessories as a 10X10 inch baking pan and a similarly sized broil rack. Both of these utensils are enamel coated so you do not have to worry about their quality deteriorating with use over time. Cleaning it is a breeze as the interior is non-sticky. Also, the removable crumb tray lets you clean it there and then after a cook. For those who have busy routines, cleaning is often not possible. However, just emptying the contents of crumb tray would remove the need of cleaning it every week. This Smart Oven 1800 Watt is jam packed with the latest technologies to give you the best performing toaster oven microwave. It has 5 quartz powered by 1800 watts power. As a result, you get fast and intense heating and can cook any sort of food in it. Wouldn’t it be great if the oven did all the thinking work for you? This one too has Element IQ technology that does the thinking for you. The quartz adjusts the heating as and when necessary and consequently, you get even heating. You can think of its quartz as dimmers that can power up or down variably. This is not present in a lot of ovens as they usually have fixed wattage. We know when you spend a lot of money; you essentially need the most innovative piece of technology. It is so smart thanks to Element IQ that it knows how to cook a particular dish. For instance, it increases power to 1500 watts from above when you use the broil option and utilize the same from below when you turn on the toast option. It has an additional function that further aids the even cooking. The convection heating feature uses a fan to circulate the heat evenly across the interior. Not only do you have an appropriate level of heating, but you have also it distributed evenly. This is why it is a little more expensive as compared with other models in the smart oven series. It is quite spacious for an over the counter microwave oven toaster. You can toast up to 6 slices at one time and make a 13 inches pizza. It is ideal for a family although anyone can keep it in their kitchen. It is bigger than most toaster ovens but nothing extraordinary. It is designed keeping in mind space issues people have in their kitchens. It is innovative in every way be it its heating or its interaction. It has magnets in its interior that pull the rack outside when you open the door. This makes it easy to lift hot things off the rack. There is a patented auto eject magnet for rack too. So here is something that is a lot more than a traditional toaster oven. This Smart Oven Pro Convection Toaster is multipurpose thanks to its many functions that will cater to varying cooking needs. It is great for toast but you can do a lot more than that. If you are looking for something truly versatile for a toaster oven microwave, then this is the right product for you. With this, there is a slow cook option as well. Besides quick foods like toast, bagels or potatoes you can even cook dishes that consume a lot of time and need less heating that usually is not the job of microwave ovens. This virtually removes the need for a slow cooker in your kitchen. We have rarely seen a kitchen appliance as diverse and versatile as this. You have 10 menu options to cook that ultimately make your life so much easier. These food items are what everyone everywhere eats on daily basis. 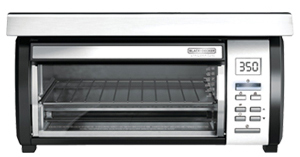 It has a spacious interior with large accessories including a 12 X 12 inches baking pan and broil rack. Both of these are from Breville and have enamel finish so there’s a guarantee of high quality and long life. Besides having your toast crispy as you like, you can cook stews and broths with the slow cooker that can stay on for up to 10 hours. Even after that, it stays on to keep the dish warm enough. Not only is it great for quick ready to eat dishes, but it is also great for time-consuming heavy dishes. Similar to other smart ovens from Breville, this one too has Element IQ with 5 quartz that ensures appropriate cooking and heating. It has convection fan as well to distribute the heating evenly throughout the interior. It has a replaceable 25 Watts G9 halogen bulb for the interior as well. Some people like the interior to be fully visible and illuminated and this caters to their needs. 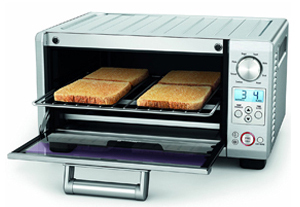 Cuisinart CSO-399 Steam/Convection Oven can be used for making crispy and evenly cooked toast. You can cook a 12 inch pizza or even put a whole chicken in this oven. It is spacious enough to cook a lot of dishes for you including 6 slices of toast. The best thing about this is the multitudes of accessories you get with it. You have a water reservoir, broiling rack, wire rack, baking pan, crumb tray, and drip tray. This is one thing that a lot of users really appreciate as suggested by Cuisinart toaster oven reviews. Besides the standard toaster functions, it has unique steam bake and steam broil functions that make it a lot more useful in the kitchen. The water reservoir can hold 47 ounces of water. It is great for toast in the morning and heavy dishes like steamed chicken in the evening. Another great thing about this model is that its buttons and controls are easy to comprehend and use. Some people find it overwhelming to have so many buttons so this makes things a lot more manageable for them. The lit LCD display clearly shows the temperature and the different modes. It is not just great for steam cooking; you can utilize it for other purposes as well such as baking, broiling, thawing, and of course toasting. The baking is convection so you get evenly distributed heat. In fact, you can even bake bread in this thing as it’s designed to bake professional quality bread which was a favorite item in many Cuisinart toaster oven reviews. This appliance in simple words is a cook’s dream. The variety of dishes you can cook with this oven makes it a great investment. And since it is from Cuisinart you have the trust that the appliance on your kitchen counter is from a trust worthy brand. 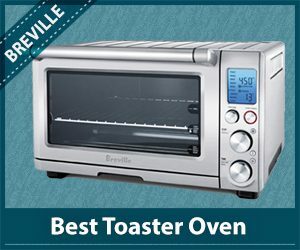 Although each product in this list is best in its own way, we think the best toaster oven is Breville BOV800XL 1800-Watt Convection Toaster Oven with Element IQ. Why have we picked this one in particular? First of all, Breville is considered the second name for quality in the world of kitchen appliances. Secondly, this particular model is very innovative and powerful and is the best convection toaster oven. When buying an oven for toast, you need something a bit more than just a toaster. It is capable of doing a lot beside making the perfectly toasted slices. The multitudes of predefined food options provide the necessary convenience in everyday life. All in all, it will prove a very useful addition to any kitchen. Whether you live alone or have a family, this should be good enough to cater to your needs. You should evaluate what your needs are. For instance, if you are solely going to use it for making toast then you should not be too concerned about its other capabilities or whether it has built-in food options. On the other hand, if you bake a lot then you should go for the one with convection heating and generous interior spaces. Obviously, your budget is just as important in deciding which oven to purchase. The prices vary from one brand to another and from one model to another. Naturally, you would want the best product for the money you have. First, find products in your range and then compare them to find the best possible solution for your needs. These ovens are essentially small but still require some space on the counter. 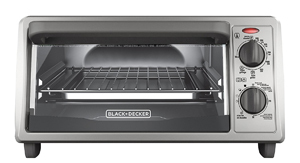 If you do not have enough space or think there will be a lot of clutter then opt for under counter toaster oven. It is not so hard to install as there is hardware included and guidelines provided to get you started. As for brands, most well-known brands produce high-quality counter ovens and under counter toaster oven only so if you buy from these brands like Breville and Cuisinart, you can be sure about the quality. These generally come with a one or two year warranty so that is an added advantage. Make sure you do not have a lot of things near the oven as it will produce heat. It is best to keep it a few inches away from the wall and other kitchen items. It is important for the oven itself and other things in the kitchen. Toaster ovens are great for any kitchen and are capable of making foods of all times from breakfast to dinner. Not only do you get toast, but you also get them in the way you like the best. From light to very dark, all possibilities are just a button or dial away. These have a lot of functionalities and are great for baking and broiling purposes as well. Some can even do the slow cooking for you like Breville BOV845BSS Smart Oven. And the best thing is they take minimal space in the kitchen. From Panasonic to Breville, you can find many great products in affordable pricing. You will not be disappointed with the great value for money they provide. Also, they will be good for years to come provided you use them sensibly. Setting up, operating and cleaning them is super easy. These are designed with the consumer’s convenience in mind. The accessories too can be washed with warm water and soap. The interior can be cleaned with a damp cloth. I’m looking for a combo oven because I’m living in a small flat and can’t even have a under cabinet Toaster oven. So far I’ve selected Waring Pro and I think that can work well for me. What’s your suggestion on this one Edna? Really loved your work though and I think you should cover more products related to kitchens and try to present some appliances that require low space in kitchens. David if you are low on space and want the best investment of your money then go for Waring pro without any doubt. The best thing about it is it’s convection heating feature that saves a lot of time. 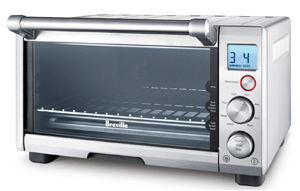 But if you can afford an under cabinet toaster oven then my suggestion would be to try out Breville BOV800XL. And thanks for the appreciation, I’ll my best to cover those products that are the need of modern kitchens. The Breville looks great – thank you for breaking this down! Gosh, I’m glad I stumble upon your page to read this very informative post! They’re all good to know! Good to know that it could be of some help. we use these at work a lot ( Im a chef) and they are so usefull! Thank you for doing all the reseach! You saved us a few good hours! Thanks for the feedback Chelf. It keeps me doing new roundups every month. Hi! Thank you for a great review. This is very helpful especially for those looking for quality kitchen helpers such as a microwave toaster. This post is a thumbs up for me. Very helpful review! loved the BLACK+DECKER TROS1000D SpaceMaker. We found your evaluation when we were looking for a replacement for our burned-out toaster and old microwave. It seemed that the Breville BOV845BSS Smart Oven Pro seemed to be the ‘best-microwave-toaster-oven’ and so we bought one! Now we find it’s not really going to replace our microwave! Can you please suggest how this toaster/oven might do the few things we used a microwave for? I imagine it might take longer: defrosting cooked soup leftovers (2-4 min), pre-heating coffee cups to about 90C (10secs), part-softening a tub of icecream (10secs), softening butter for cake-making. Brian how long this toaster oven is taking in completing those tasks? Thanks for your reply. I’ve yet to get familiar with the modes and do some trials, but we are assuming they’ll take longer. – softening butter for cake-making. I’m really sorry Brain but I don’t have this detailed information regarding this specific model. I guess you have to do a hit and trial to get the knowledge of exact timings. Yes….Exactly kitchen without oven is incomplete…This is an post…Sharing such information…About The Toasters….And toasters are my fav snack…!